Many teachers are leveraging the multimodal learning opportunities offered by infographics in the classroom. 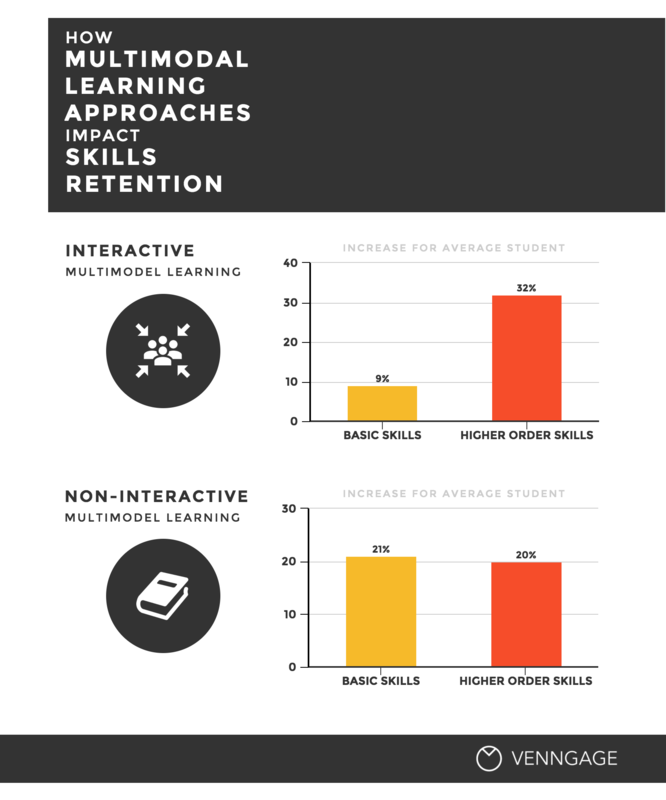 That’s because infographics enable educators and students to employ multiple learning approaches. In case you need a quick refresher, multimodal education involves making use of multiple approaches to learning. This can mean a combination of visual, audio, textual, and practical learning styles. The aim of multimodal learning is for students to obtain a “deep understanding” of the material, meaning that not only do students remember relevant facts, but they are also able to reflect on them and organize concepts into a framework of understanding. One effective way they can reflect on and organize their learning is through the creation of infographics. Any teacher will recognize the value of multimodal learning to benefit a wider range of students and their respective learning styles. According to a 2008 Cisco report, the often quoted Cone of Learning that places less stock in Visual Symbols and greater stock in Direct Purposeful Experience (learning by doing) does not accurately convey the effectiveness of visual teaching styles. Studies have shown that people actually retain information better by using a combination of learning styles that enable them to engage with material in a variety of ways. The Cisco report reveals that according to various studies, multimodal learning combining visual and textual approaches increased students’ retention of both Basic Skills (learning chemical symbols, individual learning through reading) and Higher Order Skills (critical thinking, problem solving). Interestingly, Interactive Multimodal Learning approaches like simulations and modelling, which typically involved collaborative work with peers, resulted in an increase in Higher Order Skills retention, while Non-interactive Multimodal Learning like texts with visuals, text with audio, videos and animation resulted in an increase in Basic Skills retention. 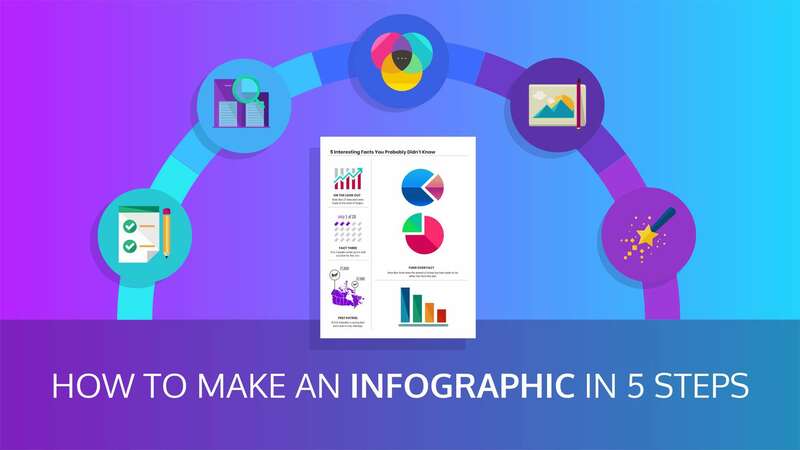 Infographics can be used in the classroom as projects that address both Basic Skills and Higher Order Skills by instructing students to work collaboratively with partners. Working in groups, students can research a topic, discuss and digest their findings through group discussion, and design their infographic (or a series of infographics) together. Infographics are also a great way for the left side of the brain to meet the right side. According to a recent Forbes article, the demand from tech companies for creative-thinking employees is on the rise. Having students think about how they can synthesize technical and statistical information with creative design will equip them with the dynamic thinking skills needed to work in this environment. Digesting data through a process of creative presentation might be easier for someone who finds straight data analysis daunting. Creating infographics also requires students to practice organizational skills and concise communication through shorter text. Teachers can also encourage more technical-minded students to collaborate with more creative-minded students to see how they can present information in fun and exciting ways. 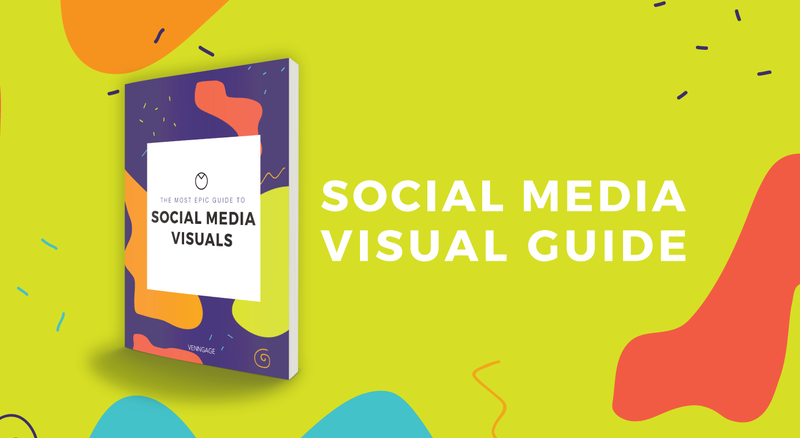 The process of analyzing, translating, visualizing, and organizing information involved in creating infographics addresses both visual and practical learning styles. Having students collaborate to discuss information and plot out how they will present it in an infographic addresses verbal and participatory learning styles. Have students conduct research. Have students research a topic. Encourage them to draw from a variety of multimedia sources including videos, articles, and statistical reports, as well as compiling their own data. What conclusions can they draw from their data? Have students identify the best layout. Provide students with some examples of different infographic templates and ask them which would work best for their research. To present data, what would work best—a statistical template, a comparison template, a survey template? 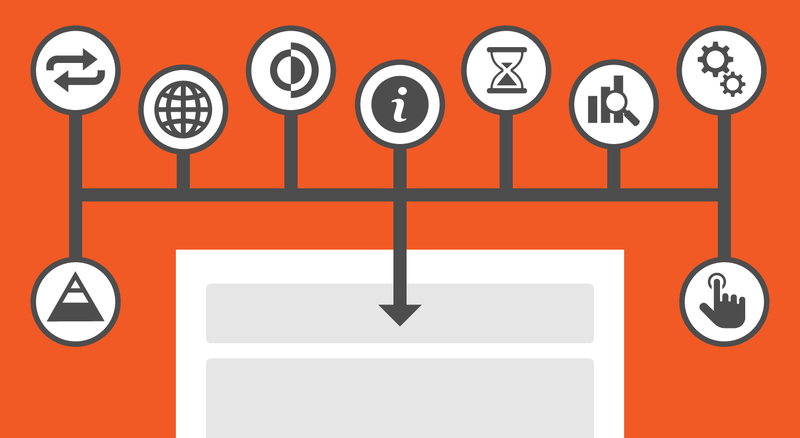 How about information on a historical event—a 2timeline template or an informational template? Have students make a rough draft. Get them thinking about the functionality of their design—what path do they want the reader’s eyes to follow? How will they relate images and text together? Have them exchange their designs with a classmate for critique—is their layout easy to understand? Is it visually interesting? Get students thinking about design. Introduce them to themes and colour schemes. How will the form of their infographic reflect the content? 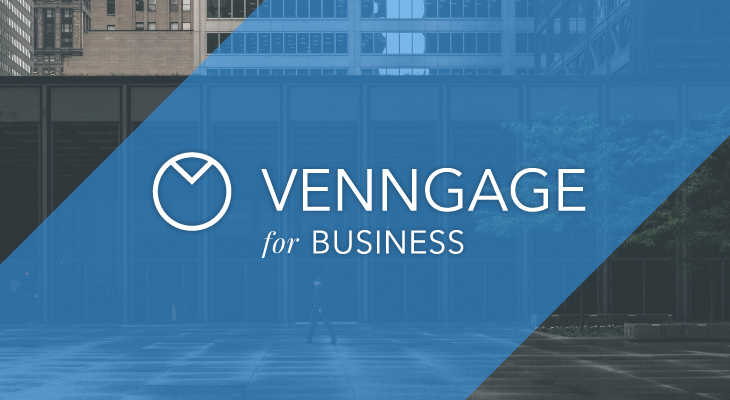 Have them choose a colour scheme that reflects the tone of the information they are presenting. What kinds of graphs, charts, or maps work best? How can they make their infographic fun and interesting? Encourage students to use interactive elements. 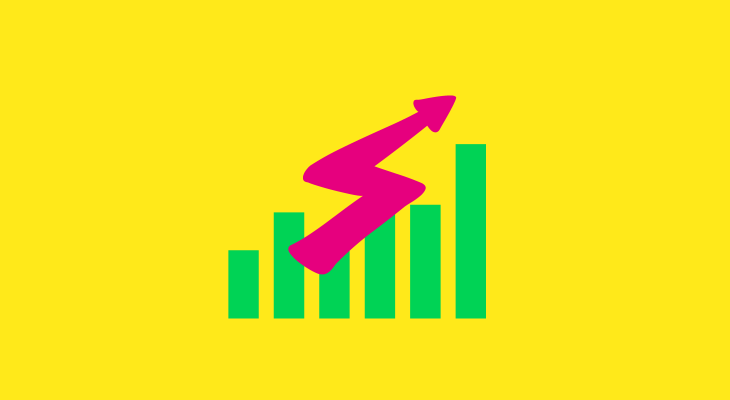 Show students how they can integrate and embed polls, videos, links, and hover charts into their infographics. This will show them how to make their presentation fun and interesting, and will point to further research questions. Have students analyze their process. What were challenges they encountered while creating their infographics? What hidden information was revealed through the process? How did they decide what information to include and what to leave out? Have students analyze their infographics. What information is the infographic showing them? What makes their infographic interesting? What works on their infographic? Not only will creating an infographic provide students the opportunity to process and organize information, but they will also come out with a finished product that they can use in portfolios when applying for jobs and higher education. Being able to demonstrate their ability to process and present data in creative and effective ways is an invaluable asset for students.